After successfully ending the 3-day Global Health Conference on February 17th, flew to New Delhi the following morning. Upon arrival at New Delhi Airport on time at 17:30, I went directly to the city of Noida in the suburbs. The objective of my visit was to attend the commendation ceremony of YES（Young Engineers and Scientists） by The Honda Foundation. This is to recognize the top 5 outstanding students atIndian Institute of Technology（IIT）, now well known to the world as one of leading technology institutions. It is a wonderful project. That is Honda, or so to say the spirit of Mr. Soichiro Honda. There was one other guest aside from myself who just appeared at the last moment of the commendation ceremony, and that was Dr. R K Pachauri. I have known him very well through the SCA (Science Council of Asia) and other conferences that we have attended in the past few years. Even 3 years ago in Bangkok, we did the keynote speech together at the AGS-Global Alliance for Sustainability conference. Last year in 2007, as IPCC was awarded the Nobel Peace Prize together with Mr. Al Gore, we can say that Dr. Pachauri became globally known as being the Chairman of IPCC. But he was already widely reputed as the leader of global warming issues among scientists. **Dr. R K Pachauri arrived from America the day before and is wearing a hat to cover his blotch on his head. After the commendation ceremony, Dr. Pachauri and myself each gave 20 minutes’ speech to congratulate and encourage the award winning students. I touched upon Mr. Soichiro Honda’s sprit and wished the students to inherit his spirit to contribute and play an important role in the global agenda we all face. I will introduce my speech on another occasion. 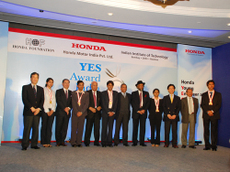 People from The Honda Foundation, executives and members from local Honda and the families of the award winners were also present and they all looked very happy. 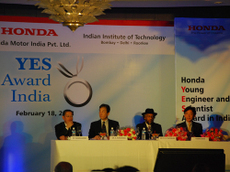 Also, Mr. Brijmohan Lall Munjal, the Chairman of Hero Honda Motors Ltd. was attending this ceremony. 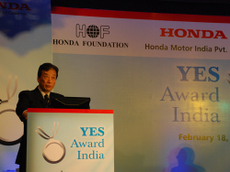 Hero Honda is a joint venture with Honda since 1982 doing production and sales of motorcycles. Mr. Lall’s son, Mr. Sunil Kant Munjal is leading the Hero Group and we both serve as a member of the President Council of the University of Tokyo. At night I had a drink with Dr. Sunami of the National Graduate Institute for Policy Studies, and Ban-san and Ishihara-san of The Honda Foundation. Meeting bright young people, it was a pleasant and wonderful evening.